I haven’t written on my blog for a long time, but recent policy changes in Oakland have generated a lot of personal thoughts that I need to write down instead of posting about it on Facebook or going on a twitter “rant”. Most Oakland residents would say that Oakland has a problem with protests that get in the way of Oakland being able to prosper. I say that the Oakland government has a problem with not addressing issues which causes protests that sometimes ends up with small groups expressing frustration that leads to vandalism that, some sectors believe, prohibits Oakland’s ability to prosper. These problems are not unique to Oakland. 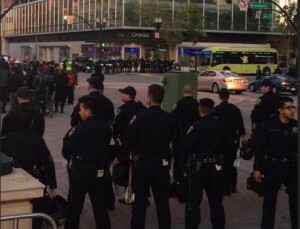 However, the Oakland government has chosen to enact policy and practice changes that they hope will help Oakland get back to business and not be distracted by protests. Some of you may say that the city isn’t silencing community with the new enforcement of night-time marches ban. Community can still hold their demonstrations by working with administration to get permits and hold day time protests. Let me demonstrate the problems with this scenario. 1. Working with the city for permitted demonstrations. Let’s just say there is another officer involved shooting of a person of color somewhere in Florida at 3 pm (PST). The news of this incident spreads like crazy over social media. The black and brown communities all across America is in mourning. A prominent activist figures Oakland should gather together to express solidarity with the family and community impacted by the latest example of police abuse of power. 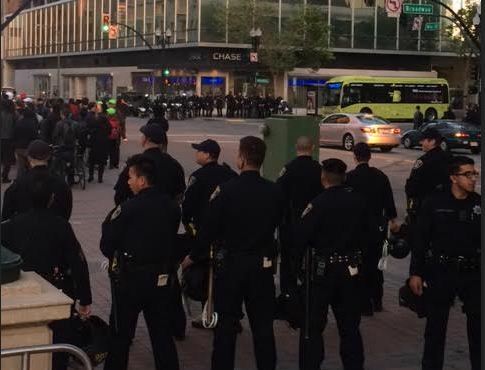 They want to hold a vigil at Frank Ogawa Plaza and a march to Oakland’s police department to express their feelings over the Florida incident and remind the city that Oakland still has a long way to go within their own police department. So the activist decides to follow the newly enforced rules of working with the city to get permission. They call the city administration’s office to ask permission to hold the vigil and march. Oops, no one answers, so they leave a voicemail making the request and asking someone to get back to them. A good and responsive staff member may call them back the very same day to get the ball rolling. But maybe the staff person is busy with a heavy work load and doesn’t see the voicemail until tomorrow morning. Welp, there goes that responsive evening protest. Oh well, it’s still a new and fresh incident. We can hold the protest tomorrow, right? The city staff person responds and says, sure you can hold a protest. Are you going to have music? You need a permit for that. Will this result in a street closure? You need a permit for that. Will there need to be police present for security? You need to apply for a permit with the police department for all of these things. How long will that take, you ask? It may take a couple of days to process this request. Is it free, you ask? It may cost you a couple of hundred dollars. Maybe you have the money. Maybe you don’t. Maybe you have the time and patience to fill out these forms and continue to communicate with city and police dept staff to organize a perfectly permissable peaceful march through the streets of Oakland during the day that maybe a couple of hundred people who can get the day off to attend…two weeks later. All of these new policies and practices don’t really do anything except silence the voice of community. These are just quick solutions to solve an “annoying” problem. These strategies may not even be legal. The National Lawyer’s Guild has come out strongly against the ban, and it’s actually against the Brown Act to compel residents to list their names at a public city meeting. The scheduling of city council meetings is a council perogative, but is it right thing to do, especially when many of these council members campaigned to get into office with messages saying they are pro- community particpation? The message that Oakland government is sending to the community is that they would rather continue with doing the business of the city than allow the community to communicate how they feel about what is happening around them. Sure electeds may say that you can always email the city council how you feel. You may even make an appointment with your council members and talk about your concerns. Heck, come and visit me at office hours! Maybe those things aren’t easily convenient to a lot of community members. What other avenue do they have? In the meantime, elected officials are super slow to adopt policy and practice changes that will actually address the issues the community feels the need to protest about. So while the clock is ticking, police across the nation and in Oakland can continue to overuse their power with little to no consequence. High rise developments in Oakland can be built at market rate pricing, with minimum community benefits that reduces the amount of available space for affordable housing. Communities of color will continue to be made to feel like second class citizens, forced to either leave Oakland or suffer and watch their home town change to something they don’t recognize. And now community members can’t even easily voice their opinion about it. At least we still have the internet.